Happy New Year! This last year has come and flown by incredibly fast. I have several things I am planning on working on this year. 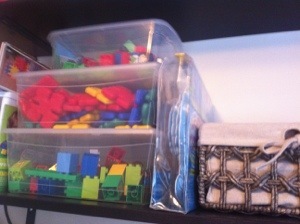 One if which is to organize and clean our entire home. Get rid of what we don’t need and use and organize what we do so it is easily excessible. Christmas of course came with a load of new toys for my son. So I’ve started in the play room. Super store has 4 large (14.2 Litres) see threw storage containers on for $14.00 a great price. Separately they were about $11.00 each. 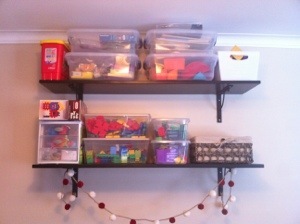 I moved some puzzles, block sets and other things into bins. i debated taking the puzzles out of there boxes. but my son is too small to small to manage them and they take up so much space. 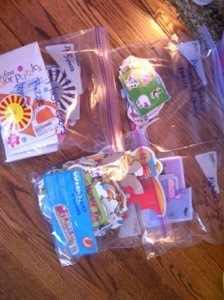 i put the puzzles into freezer bags labeled with name and number of pieces. I plan on implementing a toy rotation system eventually. I find the plastic bins super useful for a few reasons. They hold way more than the little boxes the toys come in. They don’t wear and tear like cardboard and they’re see threw so you can easily see what’s in them. 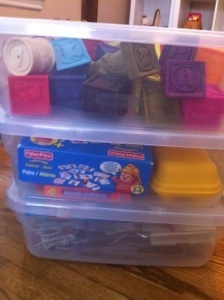 Ive saved the important instructions, add on pieces and anything else that needs to be kept in little plastic drawers. I plan on adding cute removable labels later on. Wishing you and your families a very happy new year. What are your plans and goals for this year? Go get Em!